Healthy and vibrant landscapes inspire healthy and vibrant lifestyles. Busch Design Build’s philosophy of enhancing the lives of present and future generations through our work is grounded in the concepts of sustainability and sanctuary. Busch Design Build specializes in meeting the needs of individuals, businesses, and community planners looking for an alternative to traditional landscape methods. Whether your project is a home landscape renovation, a large commercial installation, or creating a regional open space plan, Busch Design Build is ready and able to meet your landscape and native plant needs. Busch Design Build is a licensed, bonded, and insured full service landscape design firm. 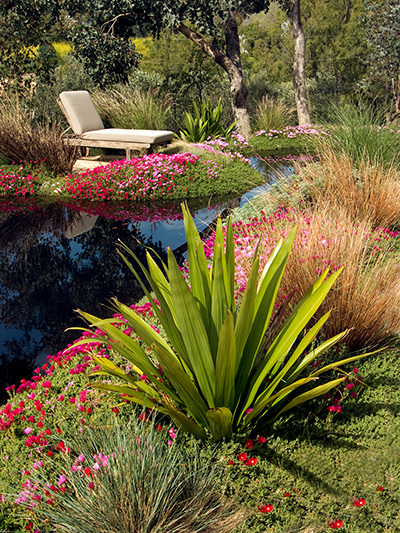 We provide landscape services to the finest residences & commercial properties in Southern California. Busch Design Build has the distinction of being a family-owned business that creates award-winning sustainable, green landscapes. With years of landscaping experience combined with knowledge of Eco-friendly design principals and organic gardening techniques, we create gardens that work compatibly with the existing environment to bring out the best conditions for your garden to thrive. We provide ecological designs, quality installations and organic landscape maintenance to take care of all of your landscaping needs. Our objective is to bring your garden to life in a sustainable and Eco-conscious way, cost-effectively and on time. Your memorable landscape begins with inspired original design. That design results through collaboration between you, our designers, and the artisans who build the landscape from our in-depth plans. Busch Design Build transforms your outdoor space into the environment of your imagination. Whether you would like a serene, Zen inspired garden or a cozy country garden that is also Eco-friendly, we can help bring your dreams to life. We believe that landscapes are more than merely a collection of natural elements that are haphazardly accumulated to be visually appealing. Instead, landscapes should reflect and enhance our lives. Great gardens stimulate all the senses, yet are functional and intriguing. Our designers consider mass, scale, line, shape, rhythm, texture, contrast and color. Our knowledge and expertise in design is applied to residential and commercial landscapes. We strive to incorporate methods that build healthy-living soils, cleanse and conserve water, and sustain natural resources. To us, sustainability starts with appreciation and respect for the earth and extends to the particular land we are entrusted to design, build and maintain. Beyond that caring we have an extensive base of knowledge that contributes to each project. While appearance, cost, function and maintenance are always of concern, sustainable practices are overlaid with an intention toward conservation of resources, and a careful stewardship of soil, water and life in your environment.